Previously, I battled with FinePix launching when I plugged in a camera. Now, I've found an application for OSX that really helps. Cameras from Flexibits, down here, allows you to have central control. 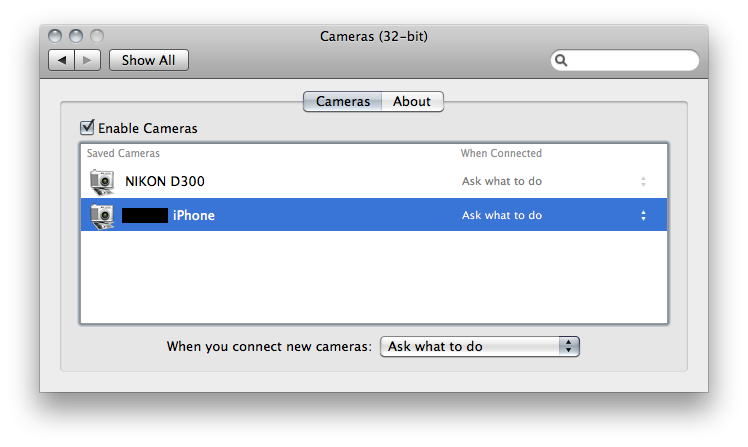 It runs as a Preference Pane, and re-directs Image Capture's device control, ie you do not use my previous hint at all. "Do you have multiple cameras? Do you spend time quitting iPhoto every time you connect your iPhone? Wish you could have your DSLR open Aperture and have iPhoto launch when you connect your point-and-shoot camera? If so, Cameras is the solution you've been waiting for. With familiar System Preference functionality, Cameras allows you to manage what happens."